Mary, of East Lansing, MI, was born on October 9, 1924, to Henri and Blanche (Disbrow Harris) Buck. She demonstrated musical talent at an early age and developed a soaring soprano voice and piano skills. After high school, she started her college career at Mary Grove College, Detroit but transferred to Augustana College, Rock Island, Illinois, to continue her vocal education and earn her degree. She met the love of her life, Victor “Bud” Lindquist when they both travelled on a choir tour. They were married on August 16, 1947, initially living in Waterford before moving to Pontiac where he advanced in school administration and she taught music, piano and voice while also starting their family. Mary and Bud were church soloists for many years at Christ Church Cranbrook and All Saints Episcopal Church in Pontiac. They moved to Fairfax, Virginia, in 1967 to forward Bud’s career while she taught music in the elementary schools of the Fairfax County Public School System. They remained in Virginia until 2002 when they relocated to East Lansing, Michigan, to be closer to family. 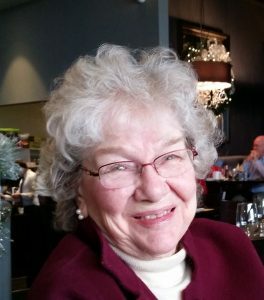 They were members of St. Paul’s Episcopal Church and she was a life-long member of P.E.O. With the help of caregivers and more recently, hospice, she was able to remain at Independence Village until her death on March 30, 2019. Mary was predeceased by Bud, her parents, three half siblings and a grandson. She is survived by sons, Kirk (Barbara) Lindquist and Erik (Kris) Lindquist of Okemos, Michigan, and daughter, Kristin (Chuck) Lohmiller of Englewood, Colorado, 4 grandchildren and 4 great-grandchildren. Special thanks and deepest appreciation to Michigan Premier Hospice nurses, Kelly and Jamie, and Right at Home caregivers, Yolanda and Mystry. A memorial service will be held at 11:00 a.m. on Friday, May 17, 2019, at St. Paul’s Episcopal Church, 218 W. Ottawa St., Lansing, MI with a visitation luncheon to follow. In lieu of flowers, donations may be made in her name to The Salvation Army; P.E.O. Chapter BB, 3843 Sandlewood Dr., Okemos, MI 48864; Michigan Premier Hospice, 312 E. Houghton Ave., West Branch, MI 48661; or St. Paul’s Episcopal Church. Arrangements are by the Estes-Leadley Greater Lansing Chapel. It was a great pleasure to be one of Mary’s caregivers. She was an intelligent and extremely beautiful lady. My heart goes out to her children at this time. It was a honor and pleasure to care for Mary. I can still hear her voice saying “hey,Babe!” She had a authentic way of making you laugh. She taught me to whistle and told me not to sing!! I have so many sayings that she has taught me. She made my life fuller and richer.